The Port Everglades ODMDS was formally designated in 2005 following the completion of a final environmental impact statement. 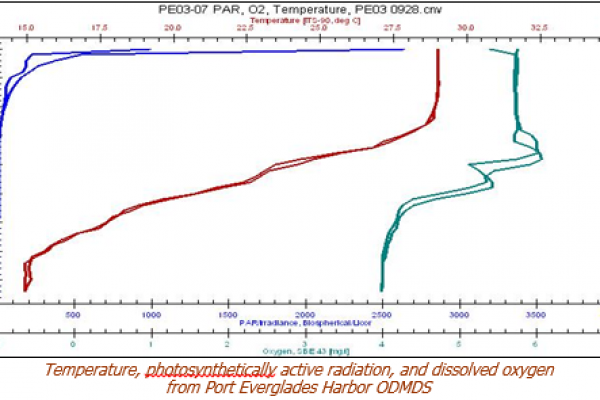 The Port Everglades site is located 4 nautical miles offshore in water 640 to 705 feet deep. The position of the site along the upper continental slope makes it strongly affected by the Florida Current. The results of a sediment-profile-imaging survey following a 2005 maintenance dredging disposal event showed that dredged material was transported as far as 2,800 feet north of the ODMDS boundary. The objectives of the STFATE model simulations were to (1) estimate the maximum extent of the dredged material deposits on the seafloor per disposal event, and (2) estimate the quantity of dredged material that remained suspended in the water column following each simulated event. The objective of the expansion survey was to characterize and summarize the physical, chemical, and biological results of a 2007 survey in and around the ODMDS within the potential expansion area. Coordinated with Taylor Engineering to perform the modeling analysis and reporting. ANAMAR reviewed and performed quality control on the resulting data. Performed quality assurance/quality control of sediment physical, chemical, elutriate, and infaunal data from the 2007 samples.